Autumn is here, finally. It’s time for us to plant our winter vegetable gardens. Right now, the backyard is a bit of a mess with a variety of peppers, cantaloupe taking its sweet time, and okra growing so tall that it can’t stand up on its own. The Italian squash (cuccuza) has overrun a tree and the back fence, but it’s still producing. We’ll cleanup and plant the backyard soon enough. Now is the time we lay into our front garden beds. The plants are still young in these pictures. Yes, front garden beds. You read that correctly. Every year we’ve spent too much money planting pansies, mums, and other cold-weather flowering plants. By April or May in this Texas weather, the plants are done, and we have nothing to show for it. Except a lot of now-ugly, dead plants in the front beds. Last year, we tried something different. We changed all the flower beds in the front into garden beds. We planted broccoli plants (over 30), and seeded four different lettuce varieties. My older daughter designed the lettuce plantings for the colors and shapes. We also planted carrots, spinach, and kale seeds. By late January, the beds were gorgeous with layers of greens. My younger daughter couldn’t wait to pick broccoli for dinner, because she announced that she didn’t like the store-bought stuff anymore. I can’t blame her. My older daughter decided that kale chips are delicious and worth making often. Our neighbors couldn’t believe how nice it looked, and we got no complaints. Even the wild bunnies respected the gardens enough to leave the veggies alone (or the coyotes, foxes, and hawks policed them for us). 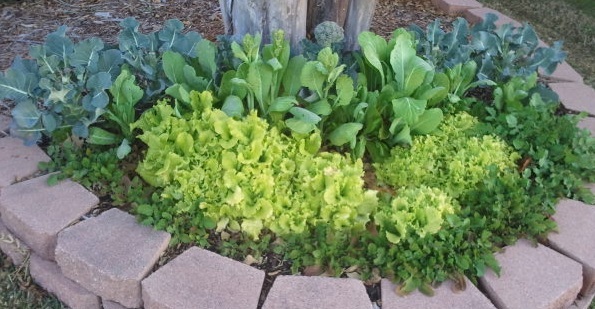 One of the side gardens with different kinds of lettuce in front of the broc. Now, the broccoli plants are in and looking lovely, as baby broccoli plants go. Next, we’ll plant the carrot and leafy seeds. By late spring, when the broccoli is finished producing, I’ll let it flower into big yellow sprays. Lovely. And completely worth the extra work to make a garden grow. Your turn… Have you gardened? Would you dare to use your front flower beds? What kinds of veggies do you plant? I hope you’ll go over to Rebecca Enzor’s blog and vote for my Marce pony entry for PonyFest12. I’d love to win a custom-made pony! Write at least 750 words every day on my middle grade WIP. Didn’t get done near as much as I wanted after a great beginning last week. Got distracted by updating my laptop and installing Scrivener. New Goal: Write an average of at least 500 words per day while doing much-needed research for my middle grade WIP. Submit and query my adult fantasy manuscript, HUNTER MOON. Last week, I submitted the manuscript to Harper Voyager (an imprint of HarperCollins). Work out at least 4 times a week. I got 3 times in this week. I’m shooting for 4 times a week this week. Read a book. I’m still reading We Are Not Alone–The Writer’s Guide to Social Media by Kristen Lamb. Weather permitting goal: Plant carrot, spinach, and lettuce seeds to accompany the broccoli plants. Post at least 3 times a week here at Mermaids Don’t Do Windows. Will keep this up!